On the northern tip of Colombia’s Caribbean facing coastline lies the polygenesis voracious port of Barranquilla, a magnet and “Mecca” for seafarers and traders from across the globe. Bringing their goods and barter, these various visitors also shared their music and culture. It’s uncertain when the African sound first wowed the Colombian town, but its seismic impact upon the South American Latin-dominated horizon is beyond doubt. As ever the exhaustive complier, researcher, musical aficionado and pioneering erudite Samy Ben Redjeb, through his critically exhorted label Analog Africa, serves-up a hearty panoramic purview; bringing to life a much forgotten epoch in the annals of musical development. No one quite sums up, or interacts like Samy, his insightful imprint doesn’t just take from its source but forms a long-standing beneficial relationship with the artists: Whether it’s setting-up a royalty and license deal with that original artist/band, or in this case exchanging his own prized and rare collection of African records for those featured on this compilation – in turn these nuggets have been used to compete in the famous local carnival’s sound system rivalries. 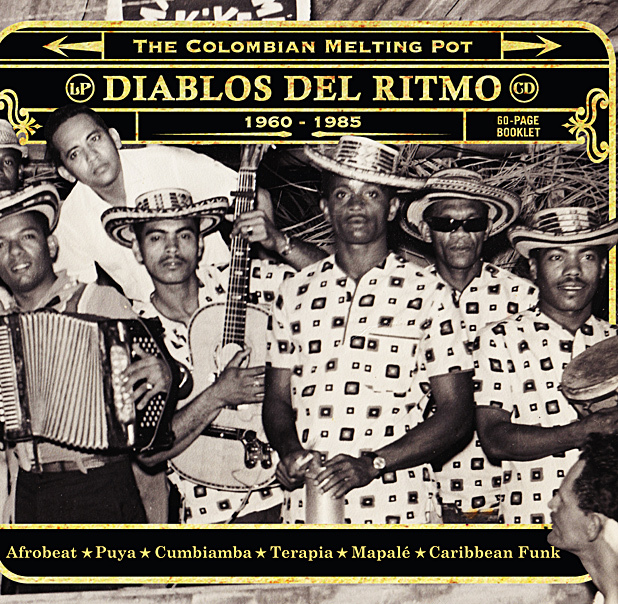 Perfectly encased within the usual beatific designed artwork (which in my opinion always looks and sounds better on vinyl), ‘Diablos Del Ritmo’ is a warm perspicacious travail through twenty-five years of omnivorous-fuelled enjoyment; and an alacrity congruous enjoyment at that, as the tropical native styles of Colombia rub-up against Afrobeat and Highlife to produce a unique dance hybrid. Into this, already, simmering pot of rhythms you can throw some Cuban and Caribbean influences, just to add a bit more allure and swinging salacious Latin sway to the mix. Perhaps it shouldn’t be such a surprise that this cross-continental pollination occurred, as Colombia is home to the second biggest black population in the “Hispanic world” (Brazil having the largest), a residue of the slave trade. An atmosphere and mood is set from the off, as the sultry gyrating Wganda Kenya opener ‘El Caterete’ promises good times. From the on in the split album unleashes one pliable concatenate track after another. The first part runs through a full gamut of, “Afrobeat, Palenque Sounds, Tropical Funk and Terapia” infectious grooves, bouncing between the unbridled shrill excited thump of Myrian Makenwas’ ‘Amampondo’, and the party funk pop of Fuentes All Stars’ conga fever anthem ‘Pégale a La Nalga’. Throughout this survey the listener is surprisingly piqued by the lingering resonance of French colonized North Africa – especially on the snake-charmer, accordion squeezed ‘Lumbalu’ by Calixto Ochoa y Los Papaupas – and Moorish Spain – cue the throaty Arabian vocal shimmy, ‘Quiero Mi Gente’ by Abelardo Carbono. Just as rousing and upbeat, part two digests the Colombian exotic sounds of, “Puya, Porro, Gaita, Cumbiamba, Mapalé and Chandé.” Preaching the joyous gospel of Latin dance, all of these sauntering tunes play with the principle rhythms and sway of calypso, salsa and, to some degree, mambo. Generous as ever, the Colombian’s marry an ever-widening catchment area of influences to these core building blocks. So you have the tribal shakedown and atavistic crying horn howls of Sonora Dinamita’s ‘Eco en Stereo’, sitting comfortably with the New Orleans, via the bazars of Cairo, jazzy licks of J. Alvear’s ‘Cumbia Sincelejana’. Evoking a litany of worldwide landscapes, you can sometimes be mistaken for thinking that Juan Piña Y su Muchachos’ ‘La Nena’ has just transported you to Casablanca, whilst constantly under the impression that you may have strayed into the Nigerian delta, or onto the Ivory Coast with many of the songs on this LP. Twelve albums in and the Analog Africa seal of quality remains unshaken: If anything this latest volume increases its reverent status. With a near-perfect oeuvre of choice records – whittled down from a thousand – there’s scant evidence of fillers, with no obvious weak links to the 32-track collection. An unintentional result of the “Colombian melting pot” is how it shows that the diverse crossbreeding and mixing of musical genres and styles has been going on, merrily, since the year nought. Rob I’m glad that like me you also enjoyed this compilation. However, I’m a little perplexed by, what seems like a simple, criticism about my spelling but which I suspect is actually a rather disingenuous snipe at my style of writing. Whether you take my word for it or not, I ensure that the spelling is correct, if any lapses or mistakes make it through then I will amend if someone points them out. Anyway what’s so wrong with using the thesaurus , isn’t that how we learn about words, their meanings and relationship to each other? Isn’t how we expand our vocabulary? Your spelling is not the problem, and I don’t think Rob is opposed to thesaurus use or sniping at you. He’s saying the review is difficult to read because you used a lot of obscure, uncommon words and used them incorrectly. The review reads like it was once a clear text but someone liberally applied the thesaurus function of a word processor and replaced a bunch of words. With effort, one can see how those words are related to the original words, but they do not have precisely the same meaning, or require different syntax, etc. The other possibility is that it was machine translated, or literally translated from a language where the equivalent words have different connotations and usage. Often people who are excellent writers in their native language and know a foreign language realtively well are difficult to read because of the assumption that the foreign language is just their native language with the words replaced — unfortunately literally translating the idioms and imagery that sound great in our own language often backfires. Andrew: Yo wil have to take my word for it, but none of your comments bare relation to fact, or allude to the processes I use to write. Despite your own clever analyses, nothing you have written is actually correct. The “difficult words” are in context and their connotations are appropriate. In fact I’m still traditional in my process, choosing to write out in free-hand on paper first, than deliberate, before using a computer. I’m English, writing in English, so your last paragraph is irrelevant. My skills as a writer – I readily admit I’m an amateur one with no formal training – are not down to any misinterpretation of language, so lets be clear. By all means take a pop, but let me remind you, fundamentally I’m trying to convey both an informative and passionate view of the music I review. Lastly, unless you know Rob personally you can only like me assume what he means, yet you make a presumption. Forgive me if my reply seems strong or misinterprets your comments in anyway, and thanks for at least visiting the site. Whilst I understand your points. I think Dom is approaching his writing with his own style, I happen to like it, sure he doesn’t always conform to the conventions of critical language or the music review it’s true, but I enjoy his pieces partly for that. However music writing is as subjective as the music we happen to write about, thus you are quite entitled to take the opposite view. I will also add that Dom puts a heck of a lot of work into each of his pieces and dissecting his subject matter and doesn’t get paid for it.He is driven by passion for his subject and language and for me that is worth more than a hundred ‘technically correct’ music reviews. I think the review is very good. Yes it’s a little wordy but that only goes to emphasise the writer’s passion for his subject matter. I am looking forward to hearing the full album (on vinyl of course!). I have been following the Analog Africa releases from day one and the quality is generally top-drawer. It sounds like this one will be no different.